A £10.8 million project on the Isles of Scilly will provide a model for electric vehicles and home batteries to play a major role in low-carbon smart energy systems around the world. 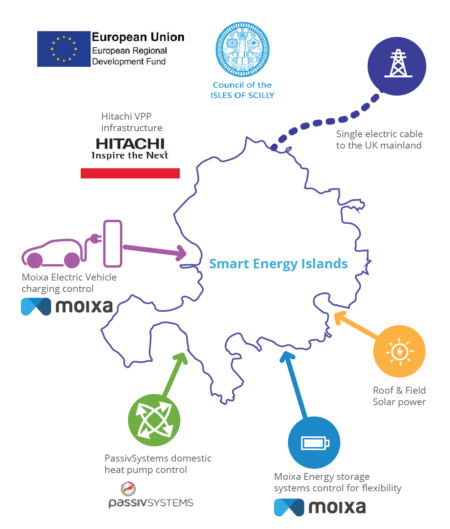 The Smart Energy Islands (SEI) project, part financed by £8.6 million from the European Regional Development Fund, will lay the foundations for the wider Smart Islands programme, which aims to cut electricity bills by 40%, meet 40% of energy demand through renewables, and see 40% of vehicles being electric or low-carbon. Moixa’s systems will integrate into an Internet of Things (IoT) platform developed by Hitachi Europe, which is leading the SEI project. It will use home batteries, electric vehicles and smart heating technologies to balance supply and demand of electricity. By easing pressures on the islands’ energy system, it will allow them to scale up renewable generation and increase their energy independence.